The name of the parish of Abernethy refers to an early Christian settlement, which was to be a Pictish royal residence in the reign of Nethan around 600AD. 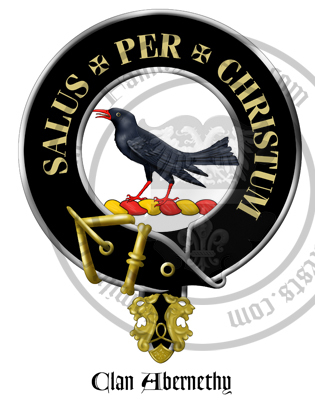 The name of the Clan is thought to originate from the lands of the same name in Strathearn.Sir Willliam de Abernethy was condemned to life in prison following his implication in the murder of Duncan, Earl of Fife in 1288, but the family still managed to prosper, with William de Abernethy (called Lord Saltoun) sealing the Declaration of Arbroath in 1320. The Name of Lord Saltoun carried from Abernethy, when Margaret, heiress to the last Abernethy Saltoun married Sir Alexander Fraser of Philorth, and their son was declared Lord Saltoun by Parliament in 1669. The name of Abernethy lives on in the title of the Duke of Hamilton, as their ancestor, the first Marquess of Douglas, was also named Lord Abernethy in 1633. John Abernethy is recognised as assiting in the discovery of fulminate of mercury, which became important, as an explosive, in the development of handguns.